The driver's mind is stimulated by the thrill of drawing out the full force of a car's engine. Each precise decision in handling reflects the confidence derived from driving a unique and progressively tuned-up work of art. Nothing is left a chance, nor are compromises made when it comes to building the best. Only one thing determines the ability of your engine in the red zone - A radiator that allows your engine to perform at its fullest potential. Koyo Racing introduces its All Aluminum Racing Radiator line to the series performance tuner. Each unit is produced to optimal dimensions for a specific make and model by fusing OE characteristics with Koyo technology. These blocks are made with a robust 2-1/16" Koyo core and meticulously detailed from their hand-welded artistry to polished finish. Leave your cooling problems behind at an authorized dealer and let Koyo Racing flag you in. 53mm 2RW Aluminum Core: 2-1/16" thickness provides extra cooling surface area for the high performance tuner. Nocolok Brazing: Tubes, Fins, Headers and Brackets are brazed in state-of-the-art Nocolok Furnace, bonding all components into an indestructible radiator. OE Specification mounting: Fan mounts are situated to OE specification; allowing both stock and performance fans to be used. hand-crafted Heliarc Soldering: Heliarc Soldering is the highest in industry standard for enforcement along aluminum connections. Tube and Fin Alignment: Construction under strict quality control and solid boxing result in pristine tube and fin alignment, fresh from the factory. KOYO Mirror Finish: All Aluminum surfaces are buffed before boxing to a confident mirror finish. 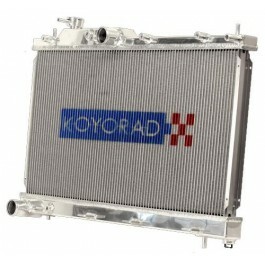 Note: Koyo All-Aluminum racing radiators are made for manual transmission applications only. Automatic transmissions will require an external transmission oil cooler. Due to the oversize construction, certain appications may fit tighter when used in different modification settings. 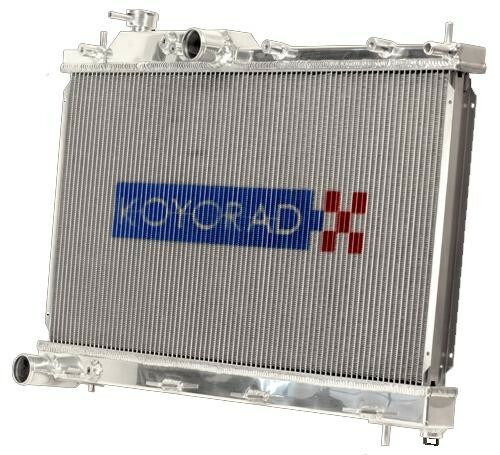 Koyo Racing Radiators are designed to meet OEM-Specific settings. © 2014 88Rotors. All Rights Reserved.